After graduating from the Department of Kinesiology and Health Education with a physical culture and sports degree, he was signed by the Seattle Seahawks. He later returned to the University of Texas at Austin to earn a master’s in advertising. And though he never saw himself becoming an activist, he became an integral part of a national conversation about sport and protest in 2016. That’s when San Francisco 49ers player Colin Kaepernick began sitting during the national anthem to protest police brutality. The action would prove polarizing, with people staunchly on either side of the debate regarding this form of protest. Because of his experience as both a military veteran and an NFL player, Boyer was asked by Army Times to submit a column in response. 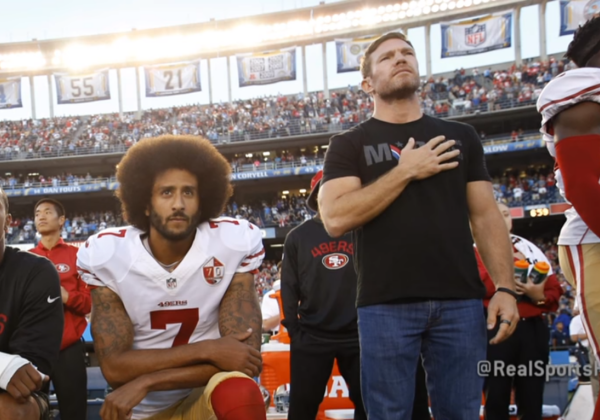 When Boyer and Kaepernick met, Boyer relayed to Kaepernick that soldiers often honor fallen soldiers by kneeling in front of their graves. The discussion influenced Kaepernick and other NFL players to begin kneeling, rather than sitting, during the anthem. Boyer says those same skills were found in his time as a Longhorn at Texas. “Sports and the military, more than anything I can think of in our society,” says Boyer, “are spaces where we get people from all over the map and different opinions, levels of education and socioeconomic statuses, and you work together and build this bond and color lines go away. It’s special to see. “Those experiences helped me a lot when it came to this activism,” he says. Interested in hearing more from Boyer? Watch his Alderson Lecture.